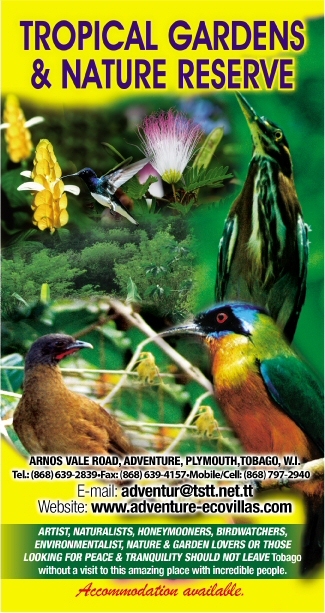 Should not leave Tobago without a visit to this 12 acre working organic estate located on the Arnos Vale Road. This small plantation grows Citrus, Mangoes, Bananas, Papaya, Guavas, West Indian Cherries and numerous other Tropical fruits on a commercial scale and manufactures some of its fruit products which are on sale. Our Mango Chutney under the label "Pirates Cove" won the Best Product prize at the 2009 Mango Festival in Trinidad. Two acres of "bush" have been retained to attract a numerous selection of birds such as the King of the Woods, Chachalaca, Woodpeckers, Herons, Egrets, Parakeets, Blue Tanagers, Humming Birds, Bare- Eyed Thrush, Jacamar, Barred Antshrike, and many others. Birds are fed daily. You may even be lucky to spot an Iguana which is on the endangered list. On a clear day at certain times of the year Butterflies are in abundance. This farm offers you the opportunity to observe Tropical Agricultural practices, as well as the possibility of picking your own fresh fruit (for which you will be charged market prices). Take the road to Plymouth, then follow the Armos Vale Road, or let your guide or your Taxi driver at your Hotel organise this Adventure. Allow at least one hour to visit this serene location. " Help us to preserve this organic farm and nature reserve by your visit and you will be helping Planet Earth. "